The troublesome trend of errors was halted for one night, at least. The offensive woes continued. Vermont managed just three runs, leaving seven runners on base, and the lack of production cost them once again. 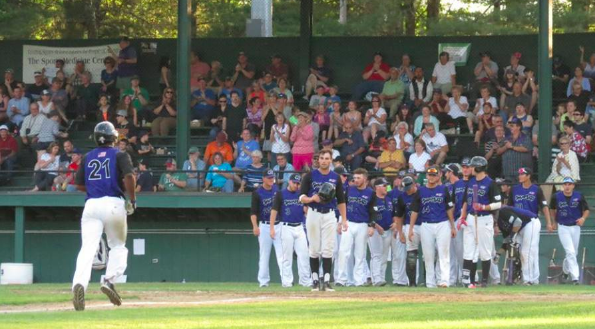 A late rally wasn’t enough, as the Keene Swamp Bats snapped a three-game losing streak, handing the Mountaineers a third straight loss with a 5-3 defeat. The Mountaineers have scored over four runs just once through 12 games, averaging just 3.5 runs per game. Even though the pitching ranks near the top of the league in ERA (3.29), troubles with errors have resulted in letting in an average of five runs a game. With an offense that’s yet to find their rhythm, that’s resulted in Vermont dropping 10 of 11 games since their season opener. Signs of life are there. First basemen Mikael Mogues, who leads the team with a .400 batting average, has been on a tear lately. The Seton Hall product is 10-for-16 over his last five games, a .625 mark that pairs with a home run and four RBIs. Unfortunately, he’s scored just three runs in that span -- a mark towards the teams struggles with runners in scoring position. Vermont is hitting .227 with RISP, and an even lower .143 mark when it comes to the final out of the inning. Joe Tietjen, who slugged a leadoff home run last night, is hitting .316 in the six games he’s played for Vermont. After him, however, the next highest hitter over the last five games boasts a .250 mark. As a team, they’re hitting .228 with just 19 runs over their last five games, where they’ve gone 1-4. The pitching has done it’s part. Michael Fairchild turned in five innings last night in his summer debut, striking out two and allowing three earned runs on four hits while walking a pair. It wasn’t anything special, but it was a reliable start. The bullpen allowed two more runs to come across, but Vermont couldn’t rally to catch up. Overall, Vermont’s pitching has been excellent during this recent skid. Over the past five games, Vermont’s pitching staff has accumulated 44 innings of work. They’ve allowed just 12 earned runs (a 2.45 ERA, which would be good for second in the league), while striking out 41 and walking 15. That kind of pitching is a welcome sight, because all that remains for Vermont is to turn the offense around. Back to last night’s game. Tietjen led the game off with a solo home run, his first of the summer, and Fairchild worked a pair of scoreless innings. However, a Fairchild wild pitch in the third and a two-run home run to the short porch in right from Jamal Wade gave the Swamp Bats the lead for good. Wade feasted on Mountaineer pitching, going 3-for-3 with an intentional walk. He finished a triple shy of the cycle, as he singled in the singled, homered in the fourth, and doubled in the sixth. Hitting out of the six spot, it was a sign of where the production in the Swamp Bats lineup came from. The top three hitters for Keene finished 0-for-11 with two walks and three strikeouts, while the 6-7-8 went 6-for-11 with three RBIs. Tietjen and Mogues combined for five hits, but Vermont’s offense struggled to get runners in. Keene tacked on a run against reliever Joey Benitez in the sixth o a wild pitch, and it took until the eighth for Vermont to answer. Shortstop Mike Osinski doubled to score Tietjen from second with one out, and a passed ball brought him in with two outs. However, the Swamp Bats answered in the bottom of the frame for an insurance run. Evan McFarland, the Keene catcher hitting out of the eight spot, singled in a run. The Swamp Bats made the most of a good start from Ryan Avidano, who scattered five hits and a walk over six innings. The lone run charged to him came just five pitches into the game, and he bounced back to strike out four. Ian Clough threw a scoreless inning of relief, and Vermonter Michael LaBeau (Bellows Falls, Vt./Castleton St) threw 1 2/3 scoreless to get the save. Vermont looks to snap this recent three-game skid with another divisional road game. They travel to Joe Wolfe Field tonight to take on North Adams at 6:30 p.m. The SteepleCats are 7-6 and sit a game-and-a-half out of first place. Surprisingly, the SteepleCats have scored 35 more runs then the Mountaineers despite hitting just .232, two percentage points lower then Vermont. This is expected, as the team is hitting .264 with runners in scoring position, and an even better .308 mark with two outs. North Adams does have the worst pitching staff in the league, however. A 4.53 team ERA ranks last, and they’ve surrendered 11 home runs (second) and opponents are hitting .288 against (worst in the league).